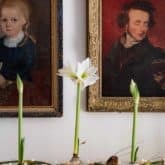 An Amaryllis that grows without any water, a vase or general care. Just stick it on a table and walk away. What is this sorcery? 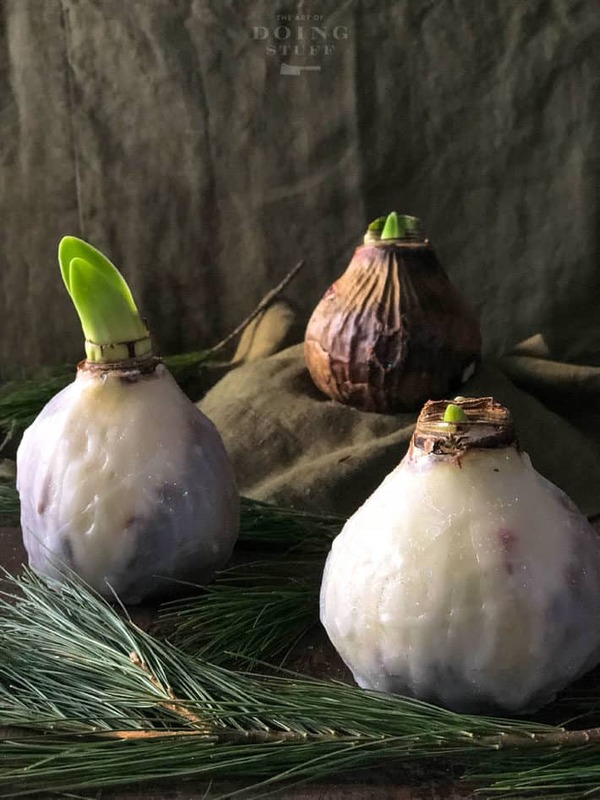 Wax dipped Amaryllis bulbs! Here’s how to make them. 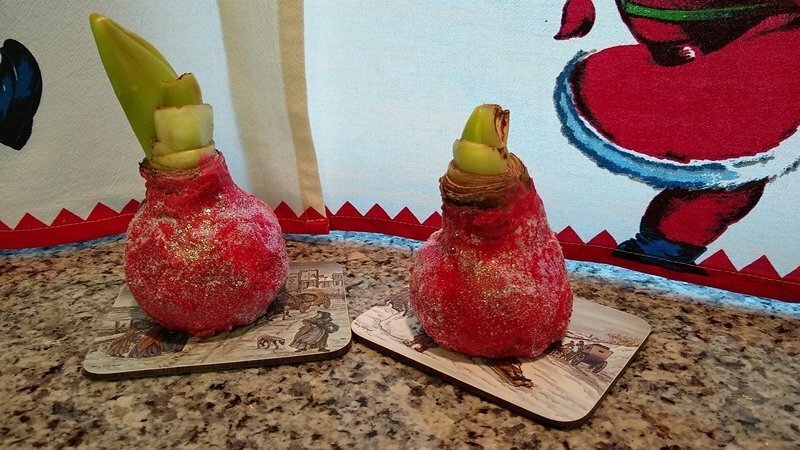 A couple of years ago I saw Amaryllis bulbs that had been dipped in wax at my local garden centre. I didn’t know what they were and figured they were just Amaryllis bulbs that had been dipped in wax to look pretty. At around $34 for a bulb I wasn’t intrigued enough to read anymore about them on the box. Fast forward to this year when I saw them again and realized the magic of them is the fact that you can just place them anywhere and they’ll grow. Along a mantle, down the centre of a dining room table tucked into greenery. 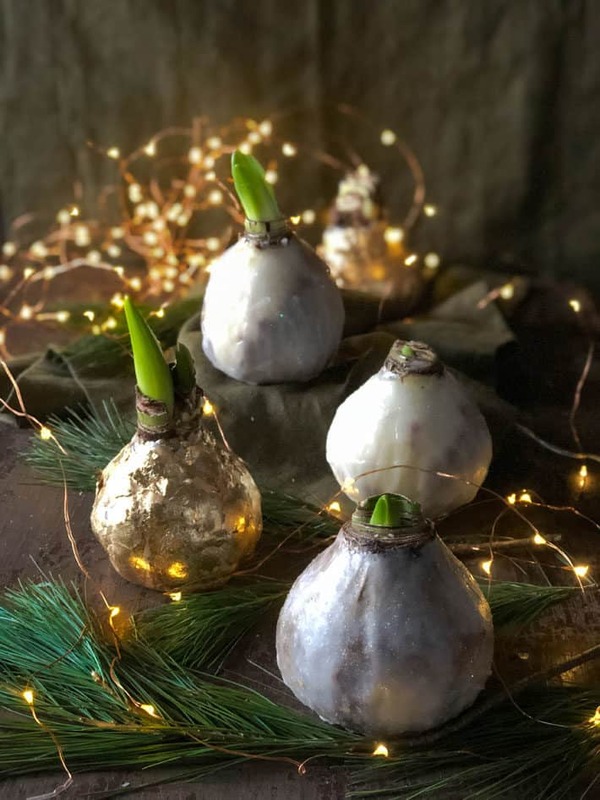 They’re less expensive this year, around $20, but they’re still a lot more than a plain Amaryllis bulb – which is between $8-$15 per bulb depending on the rarity and quality of it. omgomgomgomgomg. THIS is what my DIY dreams are made of. I got to work immediately figuring this out. 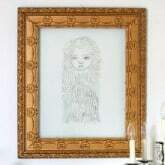 Did I mention this would make a GREAT hostess gift this season? After some online research and reading on Amaryllis bulbs I got a handle on it. The wax part was fairly obvious. Wax would hold the moisture in the bulb. But according to the makers of these wax bulbs there was some super secret process the bulbs went through to make sure they’d bloom without additional water. Since it was pretty easy to figure out how they got the Caramilk into the Caramilk bar I was pretty confident I’d crack the secret to the waxed bulbs. I gave it some thought, did some more research and decided the two things you’d need to do to ensure success was twofold. 1. Soak the Amaryllis bulbs in water so they’re fully hydrated before you wax them. 2. 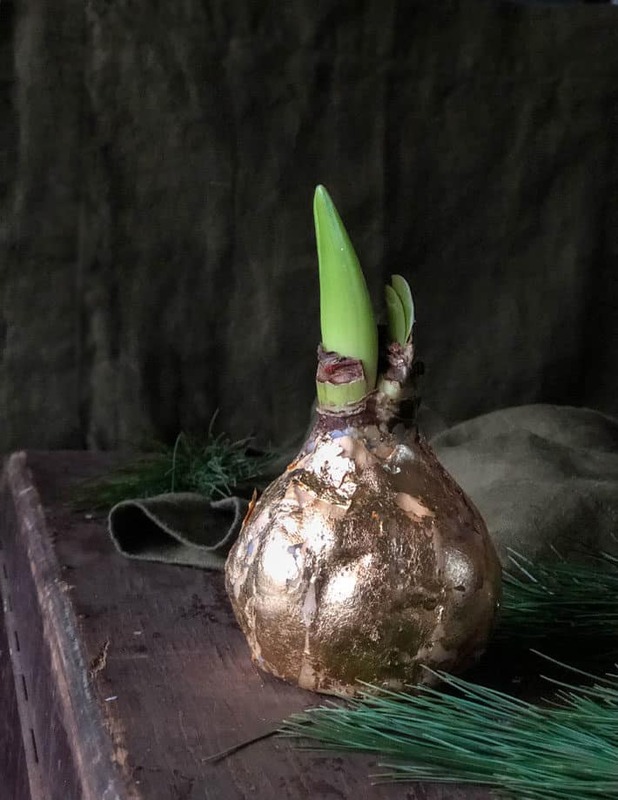 Cut off the bulb’s basal plate (the flat part the roots grow out of) to shock it into thinking it’s dying which forces it into trying desperately to reproduce itself – by flowering. My experiment seems to have worked. And I have to say I like the way these homemade wax Amaryllis bulbs look better than the store bought ones. For one thing, you can customize them. At first glance I thought the store bought waxed bulbs were made with metallic wax, but it’s just regular paraffin wax that’s been spray painted. If you have all the stuff you can also make coloured wax by mixing regular wax with wax dye, but I didn’t do that. I just wanted a quick DIY not a whole “thing” that would end up costing more money than just buying one pre-made. So instead of trying to make metallic wax for instance, I gold leafed the bulb afterwards with gold leaf I found at the Dollar Store. Other bulbs I left natural, with just white wax covering them, part of the darker bulb skin showing through and and most of the bulbs I sprinkled the white wax generously with white dollar store sparkles to make them glitter. 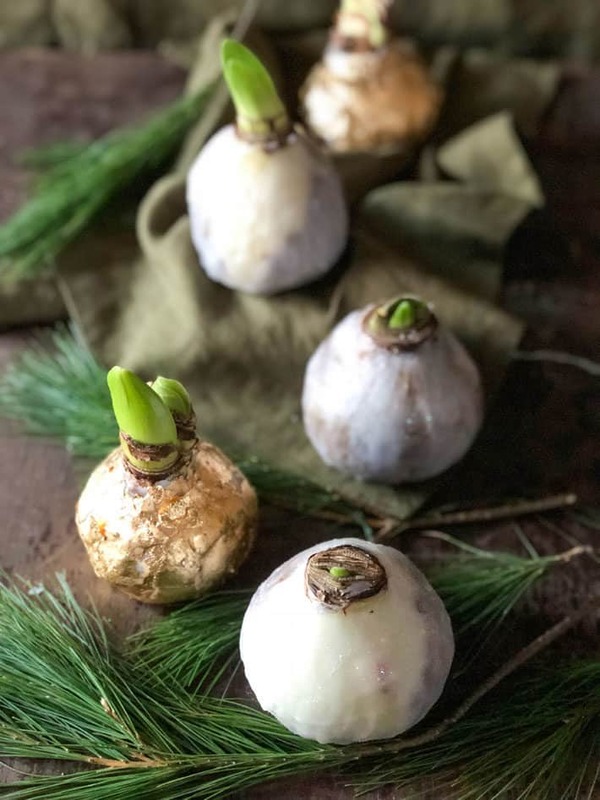 All in all this “I’m cheaping out” experiment has been a complete success and these waxed Amaryllis bulbs are going to be beautiful around the house throughout the holidays. Soak Amaryllis bulb in lukewarm water for 4-8 hours. Cut off the roots, including the basal plate. Let the bulb dry for a few hours. Melt wax (I used old candle stubs but if you don’t have those use some paraffin wax) over low heat. 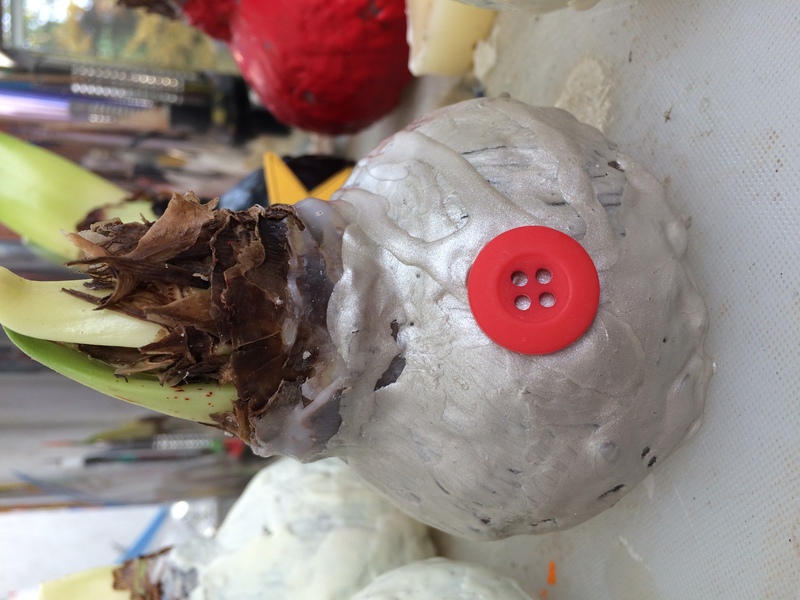 Paint the wax on the Amaryllis bulbs from the neck down covering the sides and base. Gold leaf or cover in sparkles if glitzy is your thing. Place the bulbs in a warm area of the house to encourage growth. The length of time it takes to flower usually around 6 weeks with store bought Amaryllis bulbs. I can’t give you a timeline on this because mine haven’t flowered yet, but the flower bud has popped up out of the bulb so I know it’s only a matter of time. I didn’t dip the entire bulb into the hot wax because I felt like it would be too much of a shock to the bulb. Painting it on felt more gentle. Paint the wax on until there’s a good thick coating of wax all over the bulb. It’ll take several layers. The gold foil is VERY fiddly to get on the wax. Make sure your wax is still hot when you apply the gold foil and press it into the wax with your fingers or the palm of your hand until you think it’s really stuck. And repeat. Like a million times. It’s a huge pain but the result is kindda breathtaking. The easier way to fancy up the waxed bulb is to sprinkle it with sparkles as soon as you’re done waxing it. I used white sparkles on white wax but you could do whatever you wanted. Green sparkles on green wax, green sparkles on white wax, gold sparkles on white wax … how many more examples do you need? I’ve also left my wax drippy looking. I did that on purpose. If you want things perfectly smooth just smooth the wax out with your finger or the brush while the wax is warm. Don’t soak your bulb in water for longer than 8 hours. It can turn to mush. When you cut off the basal plate make sure you do it straight so your bulb isn’t tippy. Your flat cut is what will keep the bulb stable. If you’re using spent candles for your wax, like I did, cut the burnt part of the wick off otherwise it’ll get your wax dirty looking. Don’t worry about getting rid of the wick, the wax will just melt away from it. For heating your wax I HIGHLY recommend putting the wax in a tin can and setting that can in a pot with some water in the bottom. It keeps your pots clean. Plus if you have leftover wax you can just put the whole can, wax and all in the cupboard and pull it out when you need to wax something else. Don’t forget to wax the bottom of the bulb. The whole point of waxing is to help the bulb retain moisture so as much of the bulb needs to be waxed as possible. I used Dollar Store gold leaf which was basically a mess of small gold leaf pieces. To make things easier you can buy whole sheets of gold leaf. There’s no saving and reusing these bulbs. Once you cut the basal plate off you’re killing the bulb. However, I wasn’t worried about this because I have never once saved an Amaryllis bulb to use from year to year. Finally, this was fun to do. Like, 100%, I should totally have a bulb waxing party, fun. Which of course would be much more fun than any other sort of waxing party. It’s easy, the results are great and it’s weirdly satisfying to paint wax on a bulb then cover it with sparkles. Do you have a fabulous dinner roll recipe? Mine were kind of questionable last year. I make brioche buns. Nothing is more delicious than a brioche bun. I use the recipe from the New Artisan Bread in 5 minutes a Day cookbook. ~ karen! My family insists on Katherine rolls. My eldest daughter is named Katherine and she loved these rolls as a kid. I would often make them for somewhat special dinners, but they have come to be expected at holiday meals. 1 Tbs Crystal Diamond salt (or slightly less Morton’s Kosher, or less again table salt. Taste the dough to check for saltiness. Combine milk and yeast with sugar and starter. Let sit until yeast has dissolved/softened. Add flour and knead in Kitchen Aid low speed two minutes. Rest, covered with plastic, and put the salt on top of the plastic. After 20 minutes, dump the salt in and add the egg. Knead until the dough windowpanes (this means that when you pull a piece of dough up and stretch it out it gets thin and translucent before breaking, as if it were a window you could look through.) Exact measurements of flour and liquid are often impossible since climate can change the amount of moisture in your flour, so just try to make a very soft dough that has some body. Add butter and knead until incorporated. The dough should clean the sides of the mixing bowl, but only at the higher speeds. At lower speeds the dough is too soft to clean the bowl. Dump dough out onto floured counter and fold like a business letter, then fold across once in the other direction. Rest a few minutes and repeat. Let rise, covered, for 20 minutes, then punch down by folding again in the same manner. Weigh into 3 oz balls (in a professional kitchen, I weigh the balls, but at home I just eyeball it), place on a parchment-lined sheet pan, cover with sprayed plastic wrap (spray the side that will touch the rolls, obviously, and don’t wrap tightly or in any way that would restrict the dough from rising vertically–leave some room under the wrap because the rolls rise a lot) and proof until very soft and pillowy. Egg wash generously, and sprinkle with sesame or poppy seeds (if desired–I usually do some sesame, some poppy, and some plain.) 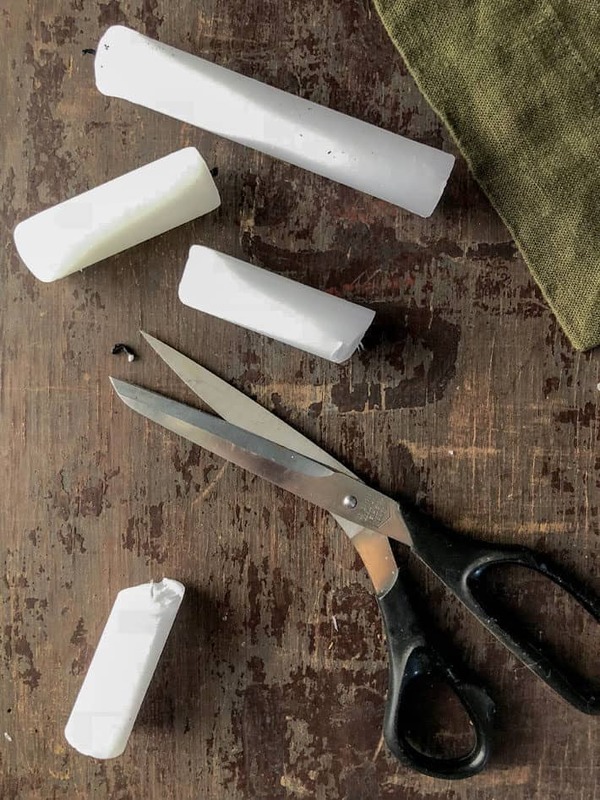 Now take a pair of shears or scissors, hold them vertically, and snip a small X into the top of each roll. This part is also optional. For more perfectly round rolls, omit this step. Bake 375 or so for about 25 minutes, or until browned properly. Note: my oven is hotter on the bottom, so I double-pan the rolls so they don’t burn on the bottoms. Note on sourdough starter: I bet you have a friend or neighbor who keeps one. If not, it is easy to make. Just mix 2 Tbs of flour and 2 Tbs of water in a bowl and cover it loosely. Somewhere around 8-12 hours later add another 2 Tbs flour and 2 Tbs water and stir. From then on, just add enough flour and water to roughly double the volume of your starter each time you feed it, which should ideally be twice a day. After maybe two or three days you should have something that looks bubbly and smells slightly sour (you will eventually have to either throw some away or use some to make bread, because you are doubling it each feeding and that is not sustainable.) When you are finished using it for your holiday baking, pop some in an empty yogurt cup (labeled!) in the freezer for another time, and also pop some into your fridge where it will keep for weeks. To activate it, just feed it again a couple of times and leave it out on the counter. Thanks Kristin! I’ll save that for next time. For Thanksgiving, I made Karen’s suggested soft brioche and they were SO good and so easy that I made another batch today to have for this week. I do love fresh baked bread! These are fantastic! Do you think any other type of bulb would work? I have the same question. 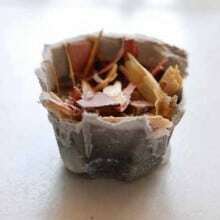 Could you wax paper whites? I’m not sure, but my guess is the reason an Amaryllis bulb works is because it’s so big, it can retain a lot of moisture in it. A paperwhite is much smaller for instance. I was going to try the paperwhites later this year so I won’t have a result until then I”m afraid. 🙂 ~ karen! And then, reliably, you provided an elegant, and in hindsight Obvious solution. So easy! So elegant! Thanks for putting Your thinking cap on for those of us who manage to miss the easy solutions. 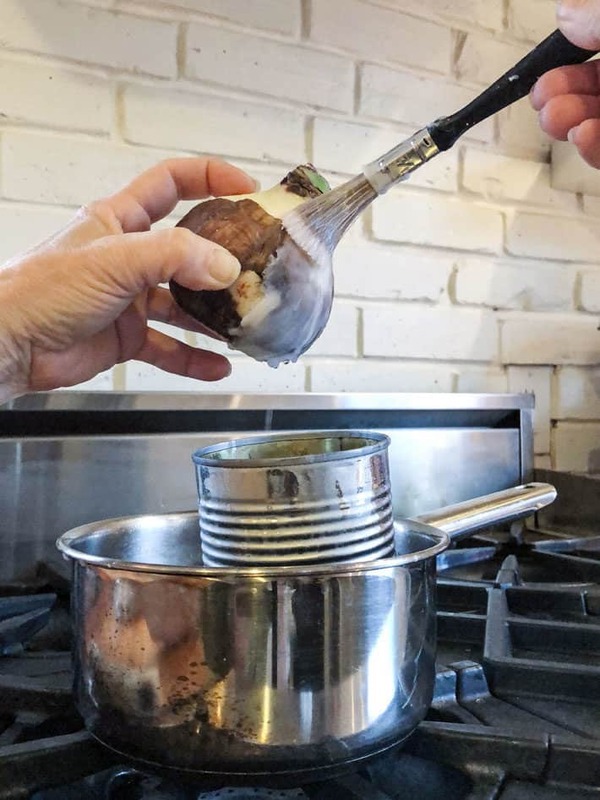 Jo, even more elegant is to use the tin can in a cheapo Sally Ann pot – don’t do wax in your favourite cooking pots! 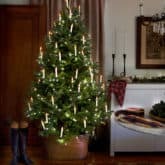 My mom made candles for the “church bazaar” for years ( use a tall cream carton, fit in a candle, fill the outsides with ice cubes, pour in the wax. peel off the carton, cover the wax with glue and put on sprinkles. I know, awesome, right?. I thought so when I was 5). She had a pathetic old pot into which the wax can was placed. Never use your good pots.. Wax goes everywhere…..
Do you need to buy special amaryllis bulbs or chill them or anything? Or are the kind that come in bags from the garden center fine? These are regular Amaryllis bulbs that you’d buy at Christmas. The ones that usually come in a box with a pot and about 3″ of peat moss. They’re sold as kits. ~ karen! Hi Constance, I didn’t try the paint. Mine are just sparkles and gold leaf. I suspect any spray paint meant for plastics would work like Krylon. Amazon sells this mini can of gold spray paint that works on plastic according to the Krylon website. Your local hardware store would have a ton of choices too. ~ karen! This DOES sound fun. I’m not sure I could intentionally murder a bulb, though. 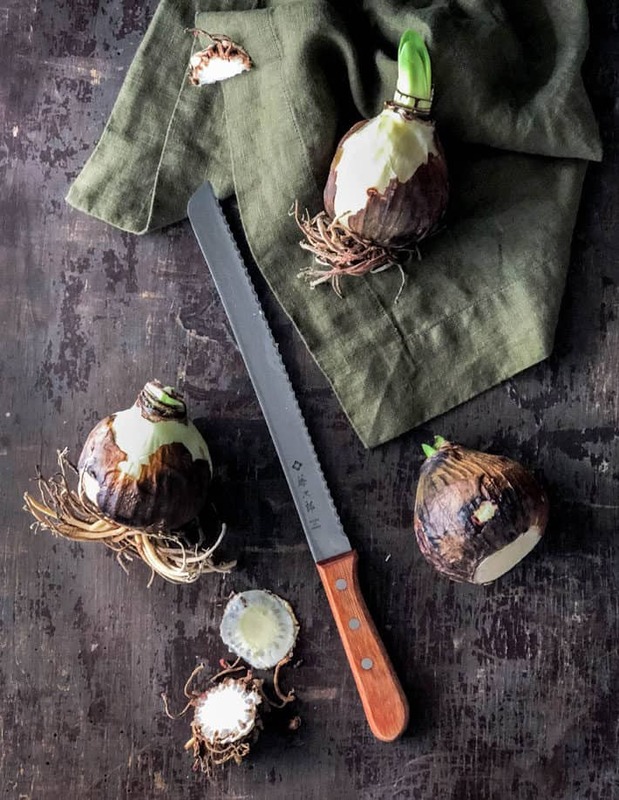 Neglect, rot, misplacing bulbs – that’s more my style. You’re a stronger woman than I.
Ok, now I get to be in your league, this I can do. No way am I gonna whip up my own patio furniture or rip up my floors let alone sand/finish them!! Oh, and your photography for these is spot on! Is the paraffin part important? Or can I use beeswax? Beeswax would be fine, I just chose paraffin because it’s the least expensive and most readily available to most people. ~ karen! i bought one of these already done from my local gardening centre last year as a gift for my mom. 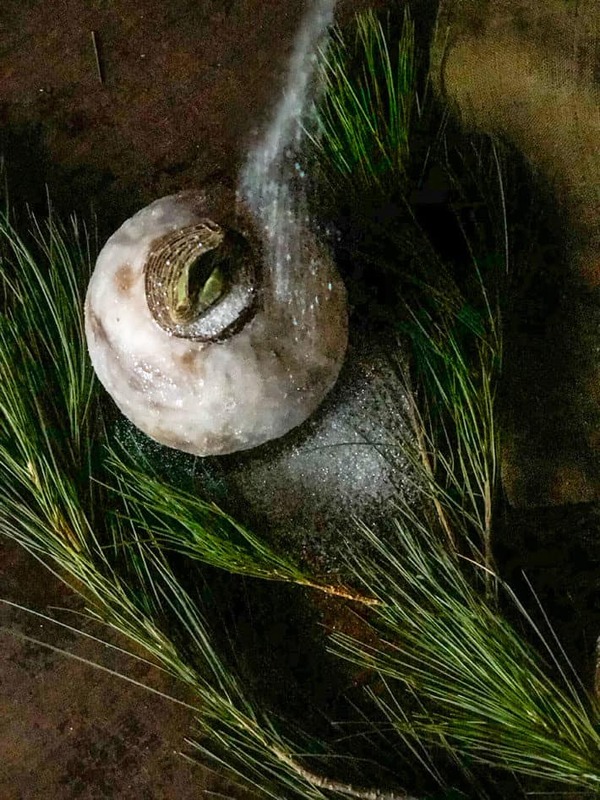 after it finished blooming, she peeled off the wax, and planted it in a pot – and it grew! I’ve had good luck reblooming my amaryllis bulbs, but waxing them with your DYI instructions would make great gifts for my “black thumb” friends, who always forget to water their plants or drown them instead. Thank you, Karen. Mainly for my wife to see when she accuses me of hording. One thing that might help is to somehow add a wide base to it. The one I bought my mom kept falling over, more and more as it grew more top heavy. If you keep the bulb close to a light source they have a tendency to grow a shorter flower. Some of the ones you buy in stores have heavy duty wire wrapped around the bottom to act as a bit of a stabilizer. I experimented with that but didn’t like how it looked, lol. So I’ll see how these do and amend next year if I have to. ~ karen! I would like to hear, after this experiment is complete, whether the flat bottom of the bulb really keeps it upright. I have never been able to keep them from tipping over, no matter what vase or etc. I have used. Also, does cutting off the roots mean you won’t be able to plant and grow the amarylis for next year? Yes, you’re definitely lessening your chances of regrowth by cutting off the basal plate. Occasionally they will regrow. But since I never save my Amaryllis bulbs and throw them out I wasn’t worried about that. I only have so much room and time in my life and getting rid of Amaryllis bulbs is something allow myself to do without guilt, lol. ~ karen! Once again, Karen, you have proved your resourcefulness and its attendant brilliance! Thank you for this idea! I’ve done amaryllis only once or twice in the past, but your take on it really appeals to me. Who wouldn’t love flowers sans dirt?? You have the BEST dollar store!!! How are you handling the tippy once the flower starts? They are quite top heavy aren’t they? They are but the bottom is now completely flat and quite wide which will stabilize it quite a bit. I have a plan up my sleeve if they start to tip which involves a flat board and a nail. Basically I’ll just hammer a large nail through a board from the bottom up and then impale the bulb. ~ karen! Awesome post! But there is no way I can cutoff the bottom ! My bulbs are coming out of the dark today so they will bloom. I think I’m going to wax them though. I grow mine with no soil suspended with their roots in water glass containers vases filled with clear glass pebbles. Put them outside in the warm weather then into the dark completely dry for a couple months. Bring them back out in winter and they bloom! More flowers shoots each year! But I love the wax idea mostly with the Gold! What exactly is that? Where do I get it? Could one use melted crayons rather than paraffin? WOW wow and another wow! The first time I visited your blog it was due to a DIY about glowing garden globes. I subscribed immediately and have always been happy with spending time with you. Now this! Gosh, a globe with a bulb next to it would make a pretty sight in my bedroom for a night light! You are wonder woman with a big, inquisitive, and imaginative brain! They are just beautiful, Karen, and quite elegant! I love the way you have displayed them. I like glam mixed with rustic and your photo depicts that exact look I love! Thank you so much for sharing this clever idea with us. I might be waxing and gold leafing many things in my house.lt reminds me of my friends mother who spray painted the toilet seats gold.Some of us need a stop button. That’s a great idea. I have a three hyacinth bulbs that I got (planted in a pot) in the spring or so and since then they were kicking around unplanted (because I did not have time for a such a monumental task). To my surprise, they started to show green shoots (2 looked very healthy, one a bit less) so i already planted two of them. The one that is remaining (still sitting on my kitchen counter) I can experiment with. P.S. For some reason, I always collect bird feathers that I find in my yard. I will tie a few feather together to use them for the painting so that I don’t have to waste a brush. As a person who makes her living doing “the other kind of waxing” I whole-heartedly embrace this foray into a different technique (that doesn’t make people scream). RUNNING to the Loblaws to buy those pretty pink Amaryllis bulbs I’ve been eyeing. Also rummaging around in the back of the cupboard for the light green candle stubs I’ve been saving for God knows how long for, it turns out, God knew what. You are so damn cool!!! Wow. Loving this. Please confirm, once these are waxed there is no need to water them? They just grow… and bloom from that first original soaking? That’s right. 🙂 ~ karen! What a great idea Karen, thanks for doing the research for us! I must live a sheltered life because I have not seen these wax bulbs prior to now. Thought it might be helpful to chime in here. The last couple of years I have bought these from Trader Joe’s (where they cost about $10US, BTW). 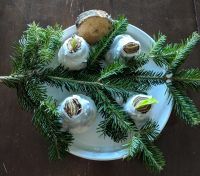 When they are finished, I take them apart to see what’s going on and find they still have roots, but they put the whole bulb inside a small balloon, then dip that in wax. Both of the ones I have bought have rebloomed when I planted them later and one bloomed twice while it was in wax. No darkness, no dormancy, no timing. Just huge and beautiful! OMFG I love this so much! Might not get to it this year, but MAN, I’m doing it next year! I’m in Ontario as well and wondered where you bought your amaryllis bulbs Karen. Were you able to find some that didn’t come with the whole potting kit thingamajigger? They were all kits, but they were on sale so it wasn’t too bad. I *just* saw loose bulbs somewhere though but I can’t remember where. :/ Hmm. Anyhow, I bought these bulbs from Home Hardware and Metro grocery stores. ~ karen! You never disappoint Karen. Thanks for sharing what goes on in your noggin. Is there any care needed as they are blooming? Hi MsPulp. Nope. You just set them on a table and leave them alone. ~ karen! Thank you, Thank you! I did it! Old candle stubs, sprinkles, tin can…after reading your post, I found Amaryllis bulb kits for $5! I got two and once stuffing them in my luggage home didn’t destroy them, I figured they were meant for this! Love your blog. Very beautiful. I was all set to give it a go until I remembered they are on the list of highly toxic plants to cats. The current feline can jump tall furniture in a single bound. What a fun and easy project. I loved the whole process and love the results! That looks great! If you Instagrammed it, I’ll share it there. 🙂 ~ karen! These are so much fun!! Only found 4 bulbs locally at this late date. I could do 100! So much fun! So easy! The color combinations are endless. Will most definitely be doing many of these next year. THANK YOU KAREN! !